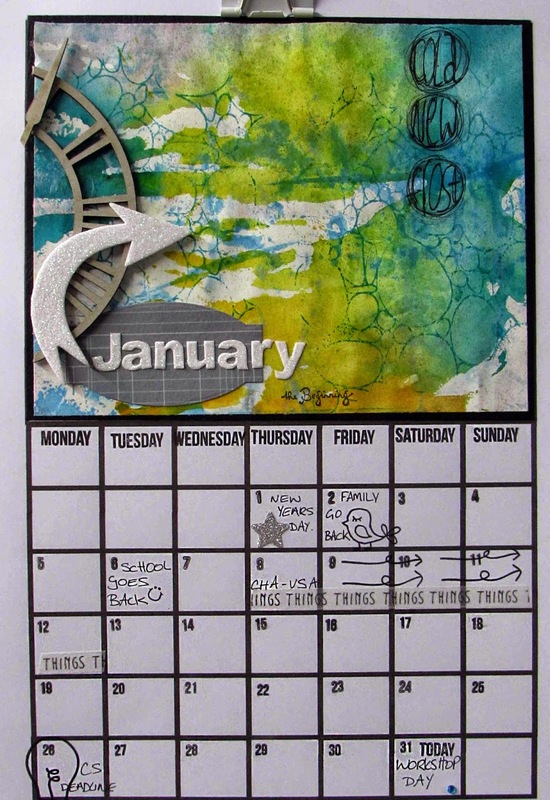 Sarah Hurley 365 (Formerly Sarah Hurley Challenges): 2014 Calendar January. Hello it's Jaine here again and I'm really excited and happy to be a part of this new project for 2015. It's great to get my teeth into a new project and I'm really hoping that my teamies Clare, Claire and I will motivate you to join in too. If you'd like to join us Sarah will be offering the calendar blank as a download along with the co-ordinating stamp sets. I've gone ahead and printed all twelve of my blank sheets ready for filling in. 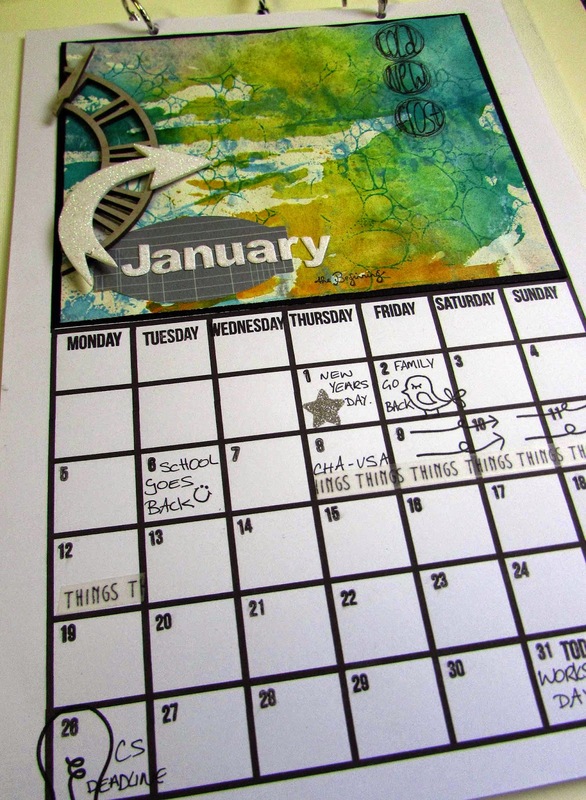 I've added my dates in manually with the new Calendar stamp set and added a journal page at the top. I've since added a couple of holes at the top of all of my pages and slipped in binding rings and mounted it onto a flat canvas so I can hang it up and flip the pages as I go. For my artwork, I've created a background with spray inks and used my new background stamp Pebbles which I'm really excited about using, and added some die cut elements which I've layered up on the left. 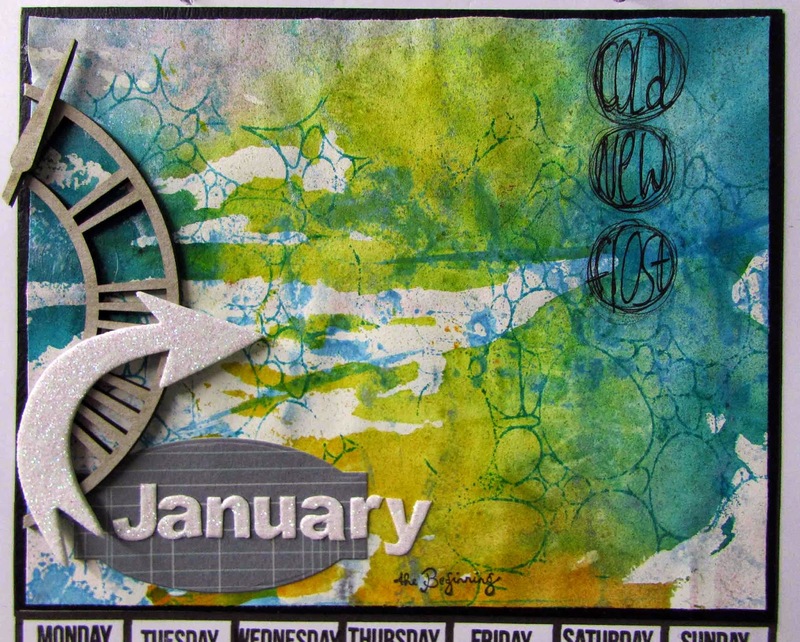 I added a few little stamped images too on the calendar itself for dates which I need to remember. It's a lovely project to do in one go, adding photo's maybe to all the pages and to give as a gift or create artwork as you go along to keep for yourself. Once you have the download and stamps you can create as many as you like and continue year after year. We'd love to see how you work with your calendar download. great first layout Jaine, so colourful!